Avid concert poster collector, Andrew Hawley from Vintage Rock Posters, announces his search for original boxing style 1966 Bob Dylan Richmond Virgina Mosque concert posters. In this tour, Dylan continued his transition from acoustic to electric performances. Dylan's backup band was called the Hawks who eventually became know as the Band. 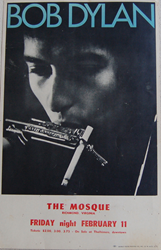 Hawley adds, “Bob Dylan Mosque concert poster was a 14x22 inch cardboard boxing style poster. The layout features a Daniel Kramer stage photograph with basic venue information.The next night Dylan would perform at the Norfolk Arena. The Norfolk show used the same tour blank.” For examples of Dylan boxing style posters, go to http://www.vintageconcertposterbuyer.com/boxing_style/bob_dylan.html. If you have an original Bob Dylan Mosque concert poster, Hawley is willing to pay $5,000 cash for each concert poster. He is also interested in any vintage 1963-1966 Dylan concert posters. Any condition accepted. Please call 310-346-1965 or email andrew (at) vintageconcertposterbuyer.com.